Perro's Auto Sales has a large and accommodating service department. We offer service with state of the art equipment and highly trained technicians. We are proud to say we work on all makes and models. Perro's does not work on the flat rate system. Therefore you only get charged for the actual time spent. Example: a job is flat rated for a time of 4 hours but we accomplish it in 2 1/2 hours you only pay for 2 1/2 hours labor not 4. This saves our customers a lot of money. Our labor rate is currently $90.00 Per hour, unlike most dealers in our area charging between $95.00 - $105.00 per hour. Appointments can be made in as little as 24 hours notice most of the time. We try to accommodate are customers as much as possible. We will also drop off our customer if prior arrangements are made. Perro's will rent a vehicle to our service customers for as little as $19.95 per day. Please make arrangements at least 2 days in advance. Perro's also has a full body shop. 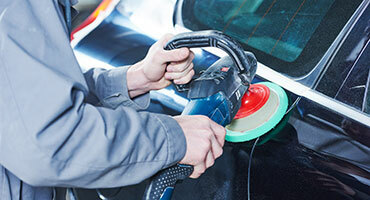 We can recondition your vehicle for $150.00 (super) or $195.00 (deluxe). We can also take care of any "fender benders" or large insurance claims you may unfortunately encounter. We have a rental business attached to Perro's. When your vehicle is in our body shop there is no need to chase around for alternate transportation. We provide this for our customers convenience. We bill your insurance company directly for any claim including the rental. Perro's Auto Sales looks forward to serving you and your family.